There have been renewed calls for UK government intervention to support gas storage capacity in recent weeks. 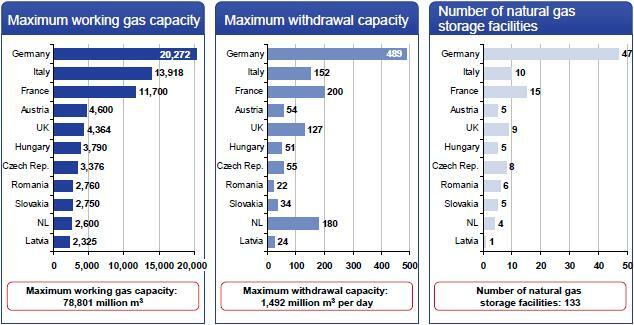 But the storage intervention debate has suffered from confusion as to the dynamics of the UK gas market. By intervening to support seasonal storage, the government risks distorting the market price signal for gas supply flexibility, increasing the cost of future gas infrastructure investment and undermining security of supply. ‘Britain has just eight days of gas supply left’ announced the headlines as snow fell across the country in January 2010. ‘When will the Government understand we need more storage capacity’ shouted the Conservative Party, then in opposition. Less than two years on, the Conservative Party finds itself in government and under attack on the very same issue: government intervention to support gas storage. The Parliamentary Committee on Energy and Climate Change published its recommendations on UK energy security of supply on October 25th. The Committee’s primary concern was that the UK faces a shortage of gas storage capacity and uncertainty as to the government’s policy in support of storage development. The Minister when questioned said the real problem with gas storage was that “the economics do not add up”, a problem that the Government aimed to ‘solve’ through measures proposed in the Energy Bill currently going through its parliamentary stages. The debate around government intervention to support gas storage has suffered from confusion as to the dynamics of the UK gas market. It is clear that as the UK’s domestic gas production declines, new sources of supply and flexibility will be required. But seasonal gas storage, the focus of the debate on security of supply, is only one of a range of potential sources. As the debate around support for storage has raged, the market has quietly been delivering new sources of supply flexibility in the form of LNG terminals, pipelines, interconnectors and fast cycle storage facilities. By failing to recognise this and intervening to support seasonal storage, the government risks distorting the market price signal for gas supply flexibility and increasing the cost of future UK gas infrastructure investment. At first glance the case for intervention in support of storage is quite compelling. The UK has a relatively low volume of gas storage capacity in comparison to other countries across Europe as shown in Table 1. Limited storage was not an issue for the UK when it was largely gas self sufficient, but the UK’s domestic gas production is in rapid decline. At the same time, the projected increase in intermittent wind capacity is likely to result in a much greater flexibility requirement from power sector gas demand. So it appears troubling that current forward market prices do not support investment in seasonal storage. The current winter/summer forward market price spread is languishing around 10 pence/therm whereas a spread upwards of 16 pence/therm is required to support new build. The political response, encouraged by some interested parties in the industry, has been to propose government intervention to ensure new storage is delivered. What has been distinctly lacking is a sensible debate around why the market price signal does not currently support seasonal storage. Fast cycle salt cavern gas storage facilities such as Humbly Grove and Aldbrough. The LNG terminals represent a particularly important evolution in UK gas infrastructure and market dynamics. These terminals have the ability to deliver large volumes of gas into the market, but gas only flows to the terminals if the UK market price is favourable relative to alternatives in Europe, Asia and the US. Supporters of storage intervention stress the unreliable nature of LNG deliveries, but this argument fails to recognise that declining production means that the UK must now compete in a global market for its natural gas, as it does for crude oil and coal. If the price is right gas will flow, a principle which applies to the other sources of UK supply flexibility. The fact that current market pricing does not support the development of seasonal storage is not conclusive evidence of market failure. Rather, current seasonal spreads are consistent with a market that is not facing a shortage of seasonal storage, particularly given the expansion of LNG regasification capacity to allow increased winter imports. The price signal for investment in shorter term supply flexibility, for example fast cycle storage, has very different dynamics to the signal for seasonal flexibility. Investment in shorter term flexibility is primarily driven by market volatility rather than forward market price spreads. The structural increase in wind intermittency and LNG import dependence that the UK faces, are conditions consistent with an increase in price volatility. Volatility is not proof of a disorderly market, but the market signal required to attract gas flows (or demand response) in times of system stress. There is a cost associated with managing this volatility that consumers will ultimately bear, although this is typically small in comparison to the underlying commodity cost. However there is no evidence that government intervention to support a perceived requirement for a specific source of supply flexibility is a lower cost or more effective solution. In our view the government has a clear choice in its approach to UK energy policy. It can either pursue a competitive wholesale market with strong independent regulation based on transparent and consistent principles, or it can make a determined shift to a centrally planned solution. Trying to define a hybrid ‘third way’ with targeted government intervention in a ‘competitive’ market is likely to undermine investment, for the reasons we set out here in relation to Electricity Market Reform. Intervention to support gas storage because of a government perception that ‘the economics do not add up’, risks permanently damaging the credibility of the UK gas market, increasing the costs of future gas supply infrastructure and undermining security of supply.